Most parents have seen a “milk moustache” on their children’s faces. My kids had bright orange “carrot moustaches.” (If Mark Twain had juiced, just imagine.) That’s how much carrot juice they drank, even as preschoolers. They also never had a single dose of any antibiotic. Not one, not ever. And they had pediatricians that they never met. Our family’s physicians were in a group practice. Doctors came and went and we never met them. Just postcards announcing who was new, and who had retired. Dr. Richard Passwater interviews Andrew W. Saul, coauthor of VEGETABLE JUICING FOR EVERYONE in Whole Foods Magazine. "Andrew W. Saul is a man who enjoys his work. But do not be misled into thinking that the fun you will have reading this book makes its message any less serious. Dr. Saul is a committed activist and therapist who has brought sound nutritional information to thousands through his books, newsletters, and lectures. "Much has been written about nutrition and juicing, so Dr. Saul decided to write something different: “This is what I did.” He has recorded a family saga that at times makes you laugh out loud and at times fills you with admiration for this charming medical teacher and his iron determination. "How much do we love our children? Enough to make them work hard hours, fighting off frogs and mice in an overgrown vegetable garden, and then drink the juices from their own organic produce? Enough to resist their complaints and overcome their (and our own) laziness? Enough to turn our backs on a totally unhealthy upbringing and start a relentless campaign to save them from antibiotics, vaccinations, pharmaceuticals, and chronic disease? That is how much Andrew Saul loved his children. The youngsters grew to college age without ever taking antibiotics and into maturity sharing their parents’ values and valuing their sharing. "Much of the charm of Dr. Saul’s story is in the humorous recollections provided by his daughter and co-author Helen Saul Case. Affectionately recalling her rebellious childhood, handled with creative blackmail and rewards by her wise and determined parents, she describes how “the system worked”; since she continues the family tradition of juicing and teaching nutrition to her own children. "If all parents were able to benefit from the advice in this book, and were to make a habit of growing or purchasing a wide variety of organic vegetables to eat and juice daily, they could do much to avoid the terrible health problems that afflict children today. "Juicing is time invested in saving time. It is better to spend some happy hours in the garden and kitchen than to be miserable and sick in hospital or in a doctor’s waiting room. Dr. Andrew Saul proves by the rich and varied activities of his life, that if you are healthy you will have plenty of time for work and fun. "I might add that work is fun when you are helping people get and stay well." How is Vegetable Juicing for Everyone Different from All Other Juicing Books? "Use it, Abe. It's funny." 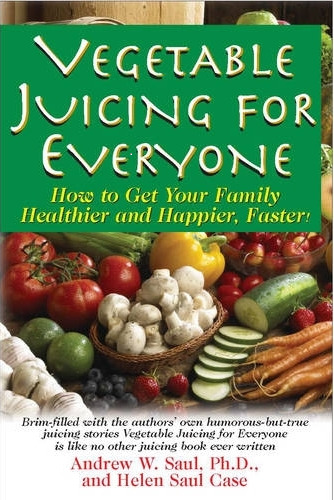 There are a lot of very good juicing books. But the only one with truly humorous, off-the-wall attitude is VEGETABLE JUICING FOR EVERYONE. We wrote a funny book to make it fun to read. We have stories and tales and experiences to share, from the oddities of our childhood to our oddities as parents. There is something in this book to embarass nearly everyone in our extended family, including ourselves. Ah, but that is what great literature is all about! Both authors have taught junior high, and you can blame those surrealistic years for some of the book’s point of view. When you actually relish working with adolescent kids with attitude, it sort of rubs off. And Now a World from our Sponsor . . . NOT! The authors have no financial connection whatsoever with any company in the health products industry. We do not market our own products, nor do we market anyone else’s. We do not make a dime from the sale of juicers, or vitamins, or foods. Or garden seed. Or shovels. We have no vested interests except our health, your health . . . and you buying armloads of our books to give to your family and friends. We personally prefer books without product endorsements, and endeavor to offer you the same courtesy. Appendix 3: Another Reader's Digest Absurdity: Red Meat is Bad – No, Wait – Good for You! This book is available from virtually any internet bookseller.